The dust, noise, and traffic of Kathmandu makes a person crave some bright vivid colors and fresh air. My favorite day trip from Kathmandu - just a couple of hours by local bus from Ratna Park - is Dhulikhel. This "party" town is located on the eastern side of Kathmandu Valley and was historically a gateway to Tibet. Similar to Chitlang, Dhulikhel is a popular weekend destination for Kathmandu locals seeking some fun. In Dhulikhel, the beverages flow, guys boogie in the fields, and karaoke reverberates across the hills. We were here for some exercise, rather than an R&R party. Dhulikhel has plenty of trails. The day we arrived, we took the "Bird Watching" route through some terraced wheat fields up to a military base and then over to Kali Hindu Temple, which has an expansive, dust-free view of the valley. We walked down the 1000 steps :-) leading past the Golden Buddha (if you walk up the stairs to Kali Temple, you will have to buy a ticket). Early the next morning, we hiked a dirt road and trail combo 18 km (11 miles) roundtrip to Namo Buddha monastery, the jewel of this region. Perched on the top of a broad hill, golden-glazed rooftops gleaming in the sun and bright, freshly painted red and white buildings, Namo Buddha Tibetan Buddhist teaching center is eye-catching! The shrine is one of the most colorful I have ever seen, with exceptional paintings of famous Tibetan Buddhist monks on the rear and side wall perimeters, three golden buddha and bodhisattva statues adorning the front wall and gorgeous, rich colored cylindrical tapestries hanging low from the ceiling. The monastery is a peaceful, quiet place to spend an afternoon. A prince and his brothers were playing in the woods when they came upon a starving tiger with several newborn cubs. The tigress was so weak with hunger that she could not even move her head when the three brothers approached. The prince was moved to tears by the mother tiger's suffering. He told his brothers to move along the trail and he'd catch up. 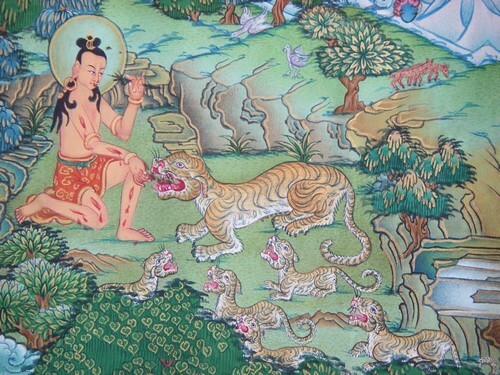 The prince thought, “What real use is this body of mine if not for helping others?” In ultimate selfless sacrifice, he slit his throat and laid down beside the tiger so that she could eat and survive to raise her cubs.